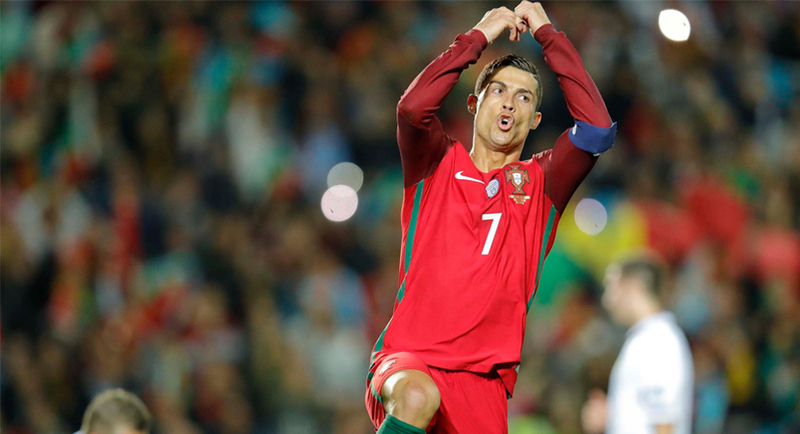 Cristiano Ronaldo missed a penalty but still managed to score two-goals as European Champions Portugal romped to a 4-1 win over lowly Latvia in their World Cup UEFA qualification Group A game on Sunday. Ronaldo dispatched his first penalty without any fuss when Nani was brought down in the box in the 28th minute, but missed the second a minute shy of the hour mark in uncharacteristic style. And in the 67th minute, Latvia equalised in shocking style thanks to Arturs Zjuzins’s emphatic strike. Portugal weren't to be outdone however, as William Carvalho rose highest to score his first-ever international goal, giving the hosts a lead that wouldn't be relinquished for the second time. Ronaldo made amends for his spot-kick error when Ricardo Quaresma’s excellent cross found him unmarked, banging in a volley in the 85th minute and putting the result to bed. Veteran defender Bruno Alves added gloss to the scoreline with a looping header late in the 92nd minute to keep Portugal in sight of group leaders Switzerland. The Swiss overcame the Faroe Islands 2-0 on Sunday and have maximum points after four games played, while Portugal are a close second with nine points.